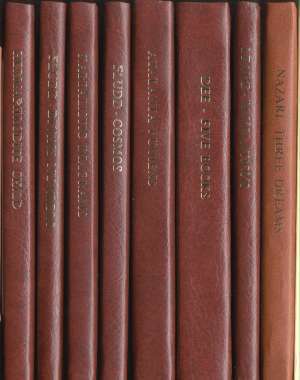 This series of limited edition hand-bound books by Adam McLean were initially produced between 1979 and 1987. They were never sold through book dealers, but only by direct mail order. Consequently, these books became collectors items, often fetching high prices on the second-hand market. Only a few copies remain of some of the older titles in this series and a number are now entirely sold out. Since 1997 fourteen new titles have been issued with more in preparation. 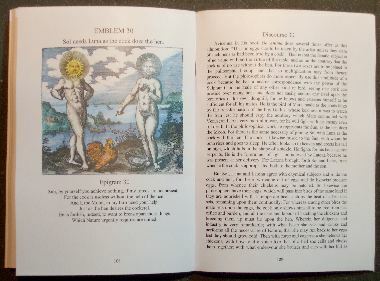 In 1987 I issued Joscelyn Godwin's edition of Michael Maier's Atalanta fugiens as number 22 in the Magnum Opus series. This focussed on the musical aspect of the work and included Joscelyn's transcriptions of the music into modern notation and an analysis by musicologist Hildemarie Streich. This sold out in 2003 and is now eagerly sought after on the secondhand book market, often fetching over $400. This new edition instead focuses on the dialogues (which were not included in the earlier edition) and uses my hand coloured versions of the emblems. It is thus an entirely different book, yet will complement Joscelyn's edition. 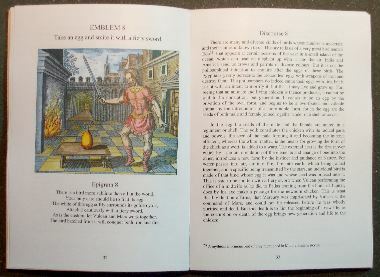 I have extensively revised the text of the dialogues, modernising the English and going back to the original Latin to sort out any problematic phrases, providing explanatory footnotes where necessary. The book with its multiplicity of coloured images is quite beautiful. As with the Crowning of Nature coloured I have decided only to produce a small edition. It should prove to be a worthwhile investment. Limited edition of 125 signed and numbered hardbound copies. 51 coloured illustrations. A5. 177 pages. Includes a Windows CD-Rom of the Atalanta fugiens slide show with the music programmed for synthesiser.